Väinämöisenlinna located in the corner of Aleksanterinkatu and Mikonkatu is one of the best-known Jugend-style buildings in Helsinki. 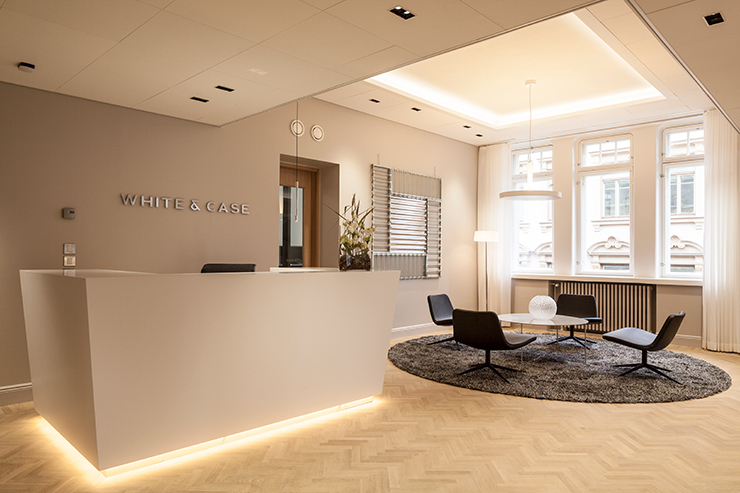 Some high-quality premises have been modernized for law firm White & Case on the fifth and sixth floors of this listed property. The design objective was to create elegant offices and meeting rooms that pay respect to the original style of the building and form an impressive setting for the firm’s art collection. One of the biggest technical challenges was to implement effective soundproofing in the more than 100-year-old stone “castle”. 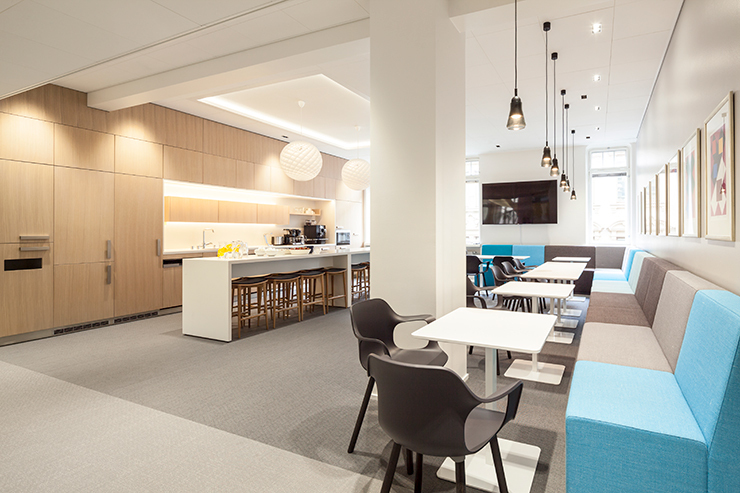 Gullstén-Inkinen provided architectural and interior design for this demanding project. Street musicians play a merry melody for the passers-by in the middle of Mikonkatu. On the fifth floor of the nearby building, a lawyer is making a lengthy conference call to the States. Thanks to effective soundproofing, the musicians, the trams or any other noise from the street does not disturb work in the offices. Mikonkatu and Aleksanterinkatu form the busiest commercial quarter in Helsinki. The location is dominated by revamped Väinämöisenlinna, a robust and for some parts playful pioneer work for Finnish national revival, the facade and interiors of which were designed by Herman Gesellius, Armas Lindgren and Eliel Saarinen. Its facade material was chosen by the three architects: natural stone from Finland, meaning local granite and soapstone from Nunnalahti. Outer walls feature faces of trolls and characters of the national epic, Kalevala, grinning to people on the street. Completed in 1901, the building is also known as the Pohjola House, as it was originally built by and for fire insurance company Pohjola. 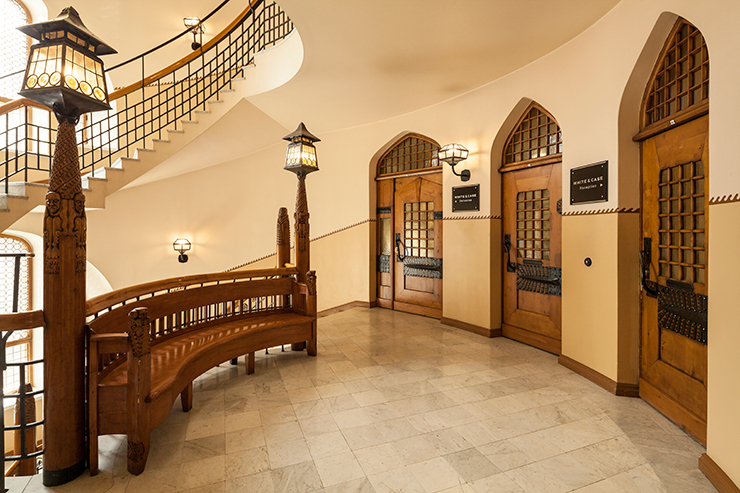 The stairwells of the building are listed for conservation. Väinämöisenlinna is classified SR-1, an architecturally, culturally and historically valuable building. Its listed features include the facade, the stairwells, and the fixed decor of the National Hall on the second floor. Originally the building included apartments, too, but nowadays it is completely dedicated to retail and office use. The property is owned by Mutual Pension Insurance Company Ilmarinen. Law firm White & Case is one of the newest tenants in the building. “We were looking for new premises for quite a while. Our objective was to find a valued property in the city centre which would allow us to build modern premises that match our operations. Väinämöisenlinna met both of these requirements. 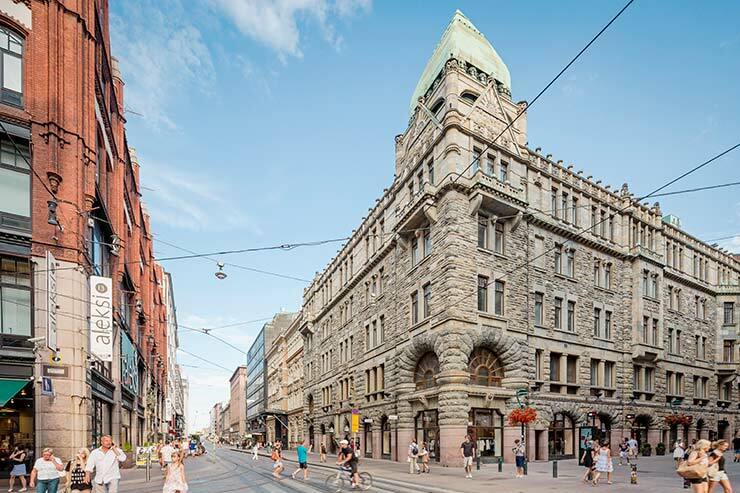 An amusing coincidence is that our company was founded in 1901, the same year the building was completed,” says Timo Airisto, partner at White & Case Finland. 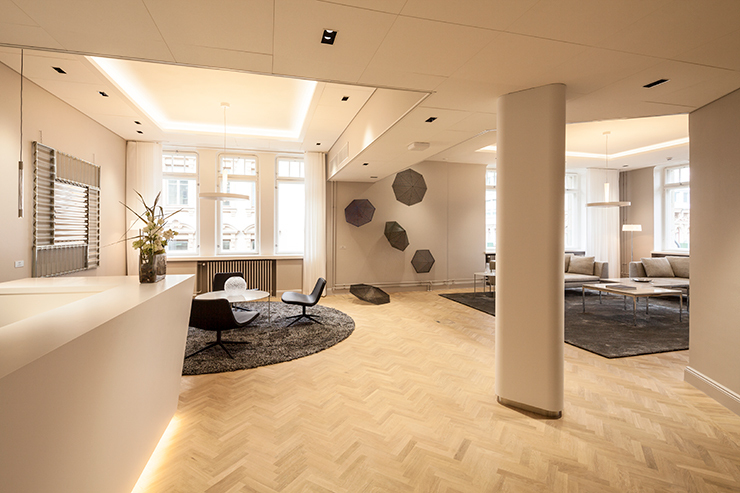 The offices of 1,400 square metres on the fifth and sixth floors of the building were designed and renovated in 2017–2018 to meet the needs of the law firm. Old structures were demolished and new premises were re-built on top of the “skeleton” of the building. At the same time, the entire property was updated in terms of building services systems and interiors. 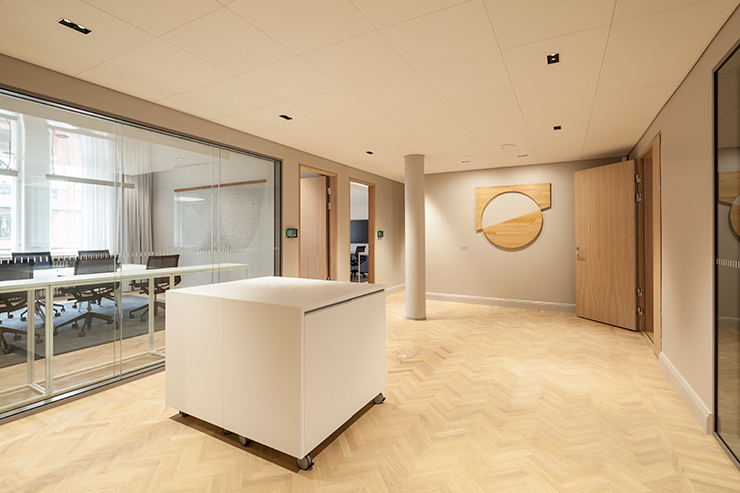 Gullstén-Inkinen provided architectural and interior design for White & Case. “We wanted help from an experienced architects’ office who were able to provide both architectural and interior design services. We also wanted to find a provider that was ‘the right size’ for us, one that would approach the assignment with vigour and sufficient resources to carry it through. We evaluated different offices based on references and interviews, and Gullstén-Inkinen was our unanimous choice,” Airisto says. White & Case Finland belongs to one of the largest law firms in the world. Its head office is in the United States. Work at White & Case includes plenty of international phone conferences. This was one of the prerequisites for the design of the premises. 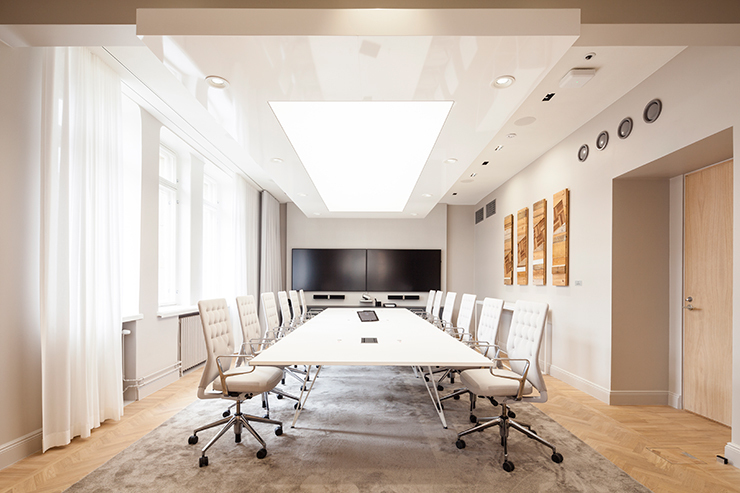 The firm needed high quality office rooms with effective soundproofing. They also needed a well-equipped meeting centre apart from the offices. ”Separate office rooms were an obvious prerequisite. When one works by phone to the other side of the world, private office room is the best place to do the work. The phone line may be bad. Confidential documents need to be at hand. Open-plan office does not function in these type of situations,” says Jari Inkinen, who was in charge of the architectural design. Another obvious requirement was that any noise from outside the office cannot be heard inside, and no sound can carry from one room to another. High expectations for soundproofing created a technical challenge for the design team. How does one introduce modern technical systems into a 100-year-old building? Some of the original ceiling height is apparent in the reception lobby. Interior walls were taking down in the middle, and only the load-bearing column remains. It has been designed wedgelike in order to match harmonious decor. In the background, one can admire “Camp Village,” an artwork by Kari Cavén”. Office room division was adjusted to match the original window openings of the building. Glass walls with black metal profiles separate the offices from the aisles. The walls between office rooms are partially of glass, too. “This way, people are able to see each other even if everybody has their own work room. Another benefit with the glass walls is that they allow maximum flow of natural light to the aisle in the middle, as the building is very deep,” says Hanna Gullstén, who was in charge of the interior design. 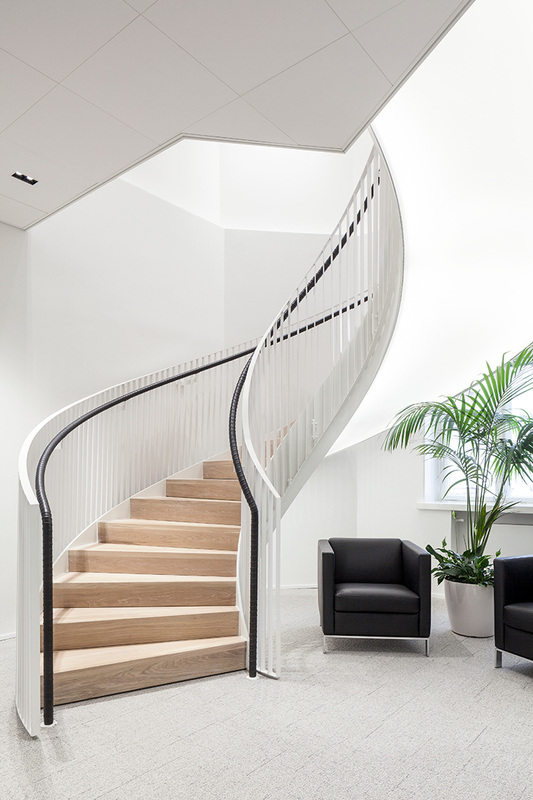 A new staircase was built between the two floors occupied by White & Case. The design was submitted for approval to the Helsinki City Museum. The black leather handrail of the interior staircase matches the black leather furniture. The stairs are lit from below the steps. White & Case’s extensive art collection was one of the baselines for the interior design. Gullstén-Inkinen’s task was to decide how to display the works in the new premises. “White & Case owns many works by Kari Cavén, for example. We decided which of them should fit the reception area and which can be placed in the meeting rooms. For the lounge area, we suggested more colourful items. The staff was given the opportunity to choose the artwork for their rooms. We were also given the task to visit Gallery Anhava and choose a new work by Kari Cavén for the reception lobby. We picked out “Camp Village” that suits the space perfectly. It was great that the client trusted our vision. Art adds colour and vivacity to the harmonious decor,” says Hanna Gullstén. 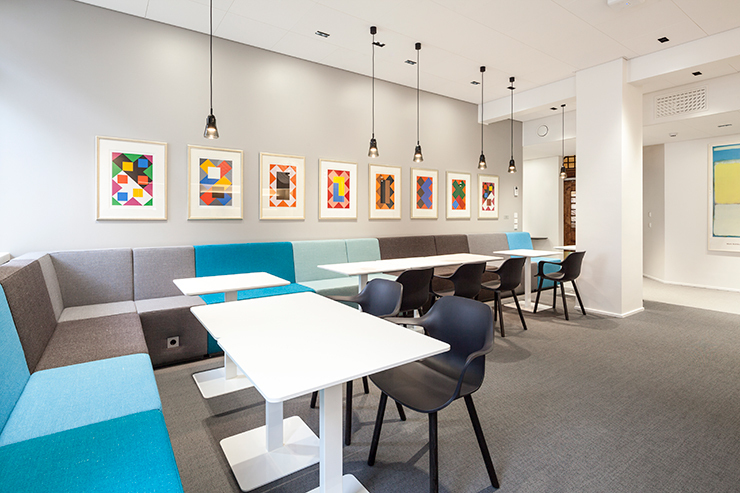 Meeting rooms display Kari Cavén’s works. Meeting centre lobby presents Kari Cavén’s “The Gravity of Earth”. There is a movable table for catering in the middle. A bit more colour was placed in the staff’s lounge area. The turquoise colour originates from the White & Case brand identity. On the walls, a series of works by Lars-Gunnar Nordström. 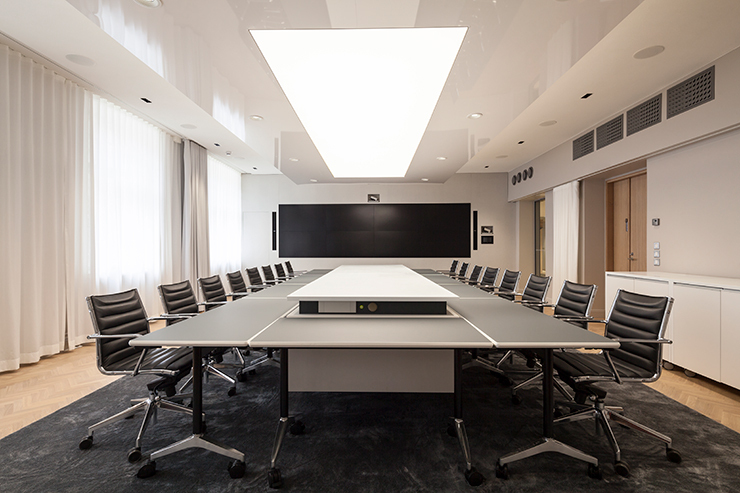 The table in the largest meeting room consists of height-adjustable mid part and foldable tables around it. When necessary, the mid part can be used as a buffet table for company events. 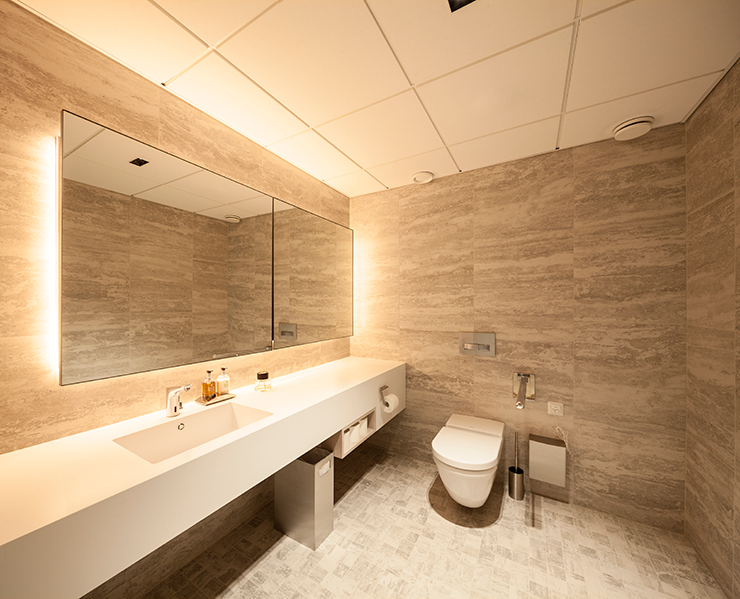 The restrooms represent quality in every detail. Reception lobby corner windows provide a view to both Mikonkatu and Aleksanterinkatu. White & Cased moved to its new premises in the spring of 2018. 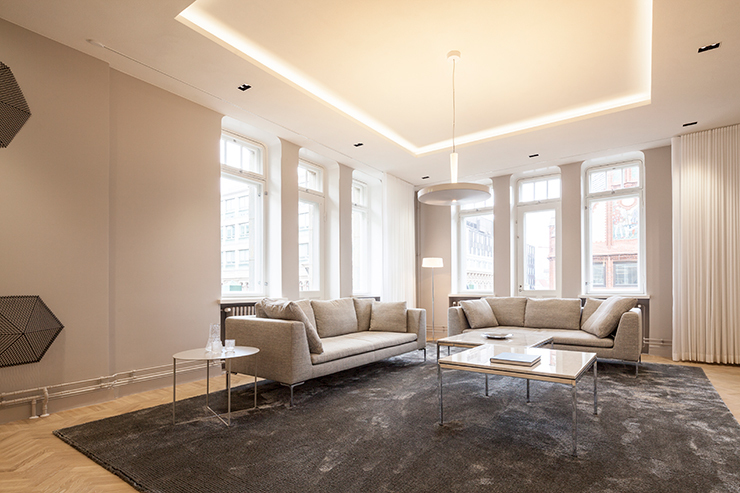 According to Timo Airisto of White & Case, the offices serve their purpose to perfection. Airisto thanks Gullstén-Inkinen for successful cooperation. “Our cooperation with Gullstén-Inkinen went really well. In the beginning of the project, we went through many discussions about the objectives and our company culture. The architects understood our views and proposed modern, customized solutions,” Airisto recalls. Gullstén-Inkinen Design & Architecture is a creative design agency with experience and vision. Our solutions have a small carbon footprint and a big heart.